From low-key daywear to fabulous evening styles, our range of plus size maternity dresses has your look covered. Designed with you and your bump in mind, our dresses combine comfort and style in curve flattering shapes. Shop your favourites in sizes 16 to 32. 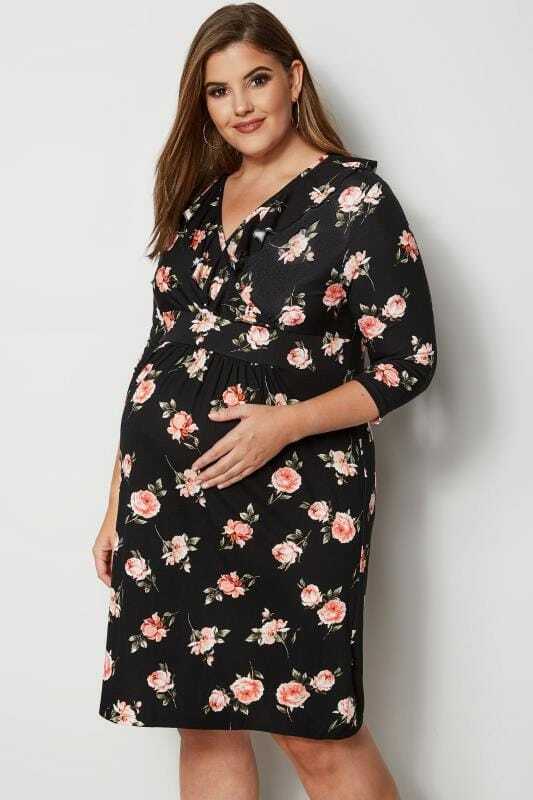 Give your wardrobe a new-season update with our range of plus size maternity dresses. With styles to suit special occasions, evenings and formal events, this collection is brimming with outfit options to ensure that you stay on trend. Designed to fit your shape and flatter your bump, choose from modest midi styles and floor skimming maxis to find your perfect look. Elevate your maternity wardrobe with a sophisticated plus size formal maternity dress. Choose from comfortable stretch fabrics or more structured designs in a range of midi and knee-length designs. Chic and effortlessly stylish, our collection features polka dot prints and understated block colours to ensure that you stay on-trend. Simply team with your favourite courts for a desk-to-dinner look. Sparkle the night away with one of our plus size maternity dresses for special occasions. Get party ready with a timeless chiffon gown, or add a touch of glam with a jewel embellished option. Finish the look with a pair of high heel court shoes and an understated box clutch. Whether its relaxing around the house or brunch with the girls, our collection of plus size maternity maxi dresses serve as the ultimate daytime go-to this season. Effortlessly flattering, pick from bold printed styles or elegant embroidered options for on-trend style. In a range of comfortable jersey fabrics or elegant woven styles, team with your favourite flats and a cross-body bag for an effortless casual look.